With a tradition that goes back almost 10,000 years, clay roof tiles can be considered as one of the oldest constructional materials. Crafted with care with the four elements of earth, water, air and fire, natural clay roof tiles have a timeless appeal that combines natural elegance with human artistry. 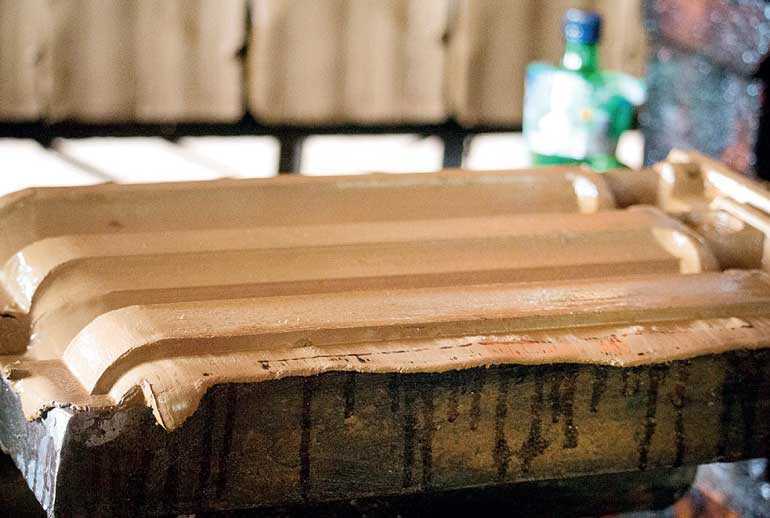 Clay tiles are still prized for their UV and fire resistance and durability with a life expectancy of generally about 100 years, and often several hundreds. Today, they are available in an extremely wide variety of textures mix shapes, surfaces and colours to suit different requirements and various personal tastes. With excellent physical and natural properties, clay remains the most popular and reliable building material which provides outstanding protection against moisture and frost. Clay is a material which is available in abundance in some areas. But due to the environmental impact caused on river banks upon extraction, there appear to be problems in procuring natural clay across the island. 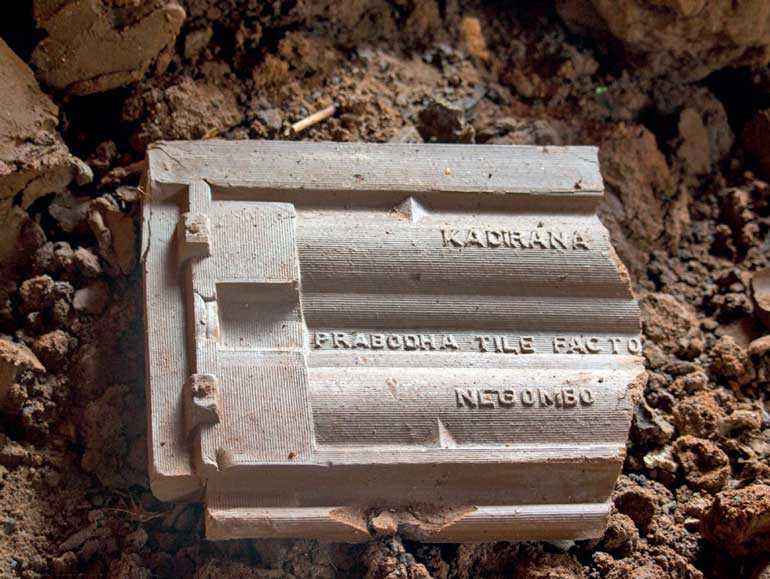 The natural clay for the tiles are sourced from Sri Lanka’s best extraction sites: Goda mati (sandy clay) from Badalgama and kiri mati (puddle clay) – a version of clay from Bangadeniya which takes care of the mass and the strength of the tile. 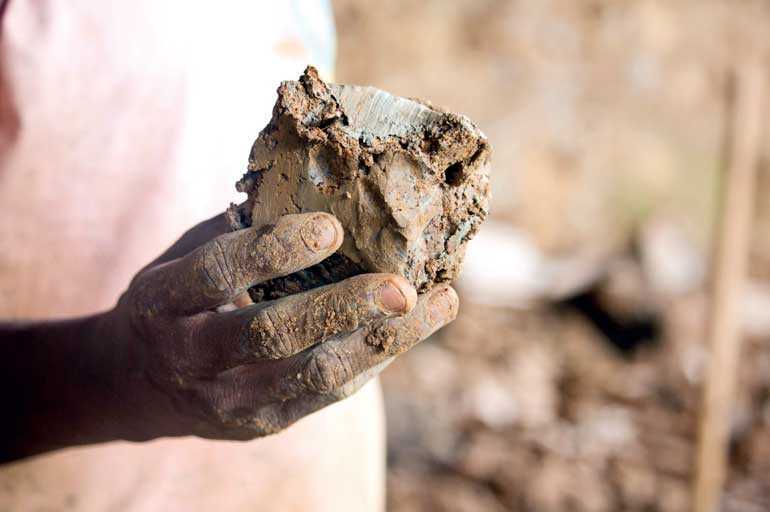 Maintaining a constant supply of clay is a challenge that the manufacturing firms face today. The increasing industrial demand has led to a surge of cost per clay cube. A 1 kg clay cube costs around Rs. 8,000 in the market today. Maintenance of clay roofing tiles needs no skilled workmanship. 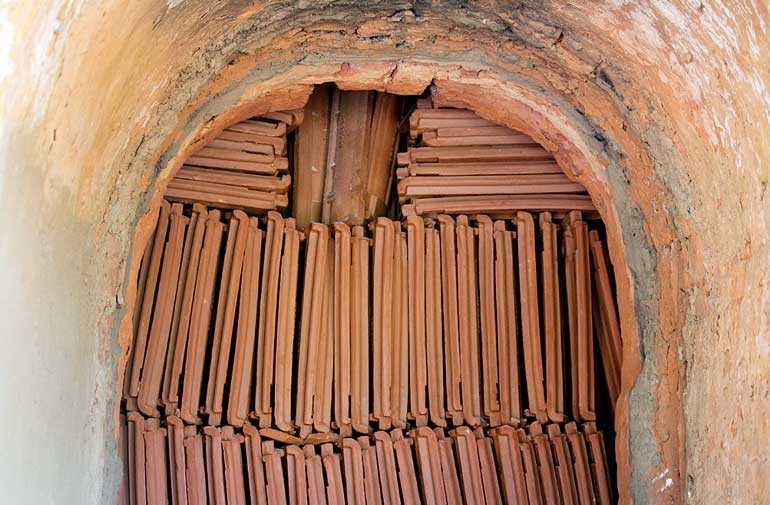 As of 2018, clay roof tiles are being sold for Rs. 50 each. The price per unit and overall installation cost of clay tiles, including labour fee are comparatively low, making it the ideal roofing material for people with medium-level incomes. 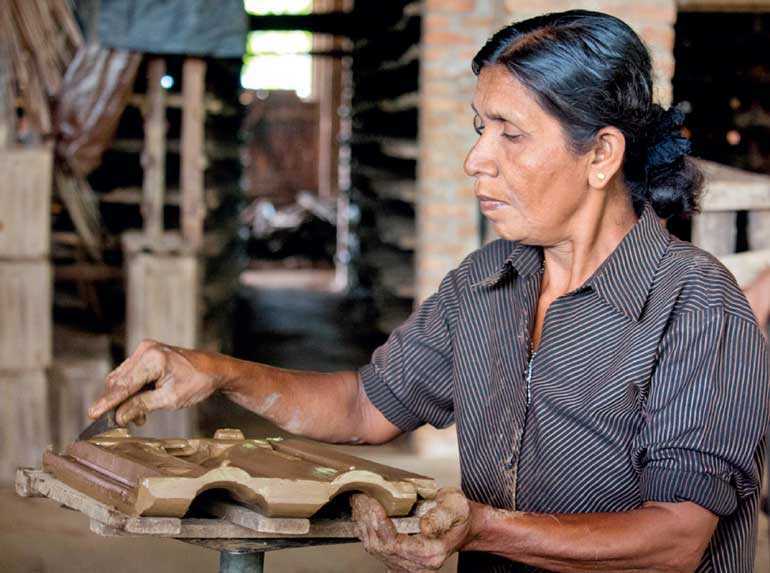 Most of Sri Lanka’s clay tile factories are centred around Wennappuwa, Negombo and Dankotuwa. 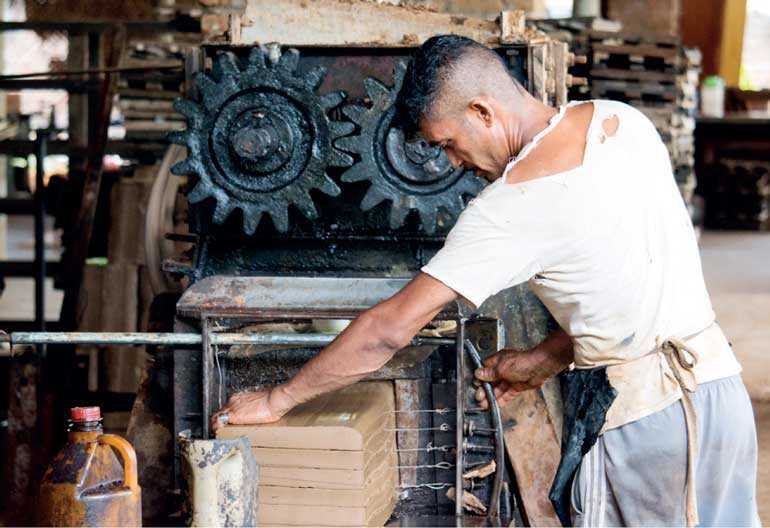 At present, local tile industry suffers from a severe shortage of labour strength. Given the socio-economic conditions, the youth in the area move from factories to less laborious means of employment which provide them higher salaries. The production process of tiles requires greater delicacy and care as they are liable to derangement or deformation. The first step of the manufacturing procedure is the mixing of the two clay varieties to a ratio of 2:3. Once the clay is arranged in layers alternatively on a bed, it is kept there for two weeks. Water is added depending on the climatic conditions. The initial process of mixing is done manually by trampling the pile of clay and later the texture is improved with the help of a mixer. Next, the clay is put into a machine through the cone at the top where the mixture gets ground, well mixed and become almost a decadent, homogeneous substance similar to chocolate. The output is obtained as clay plates which are kept on the lower part of the mould of the electrically-driven pressing machine to be pressed. The machine can produce approximately eight to 10 tiles per minute. The remaining excess material around the moulded tile is shaped with small knives. The drying of the tiles is done in the shade of coconut leaves. 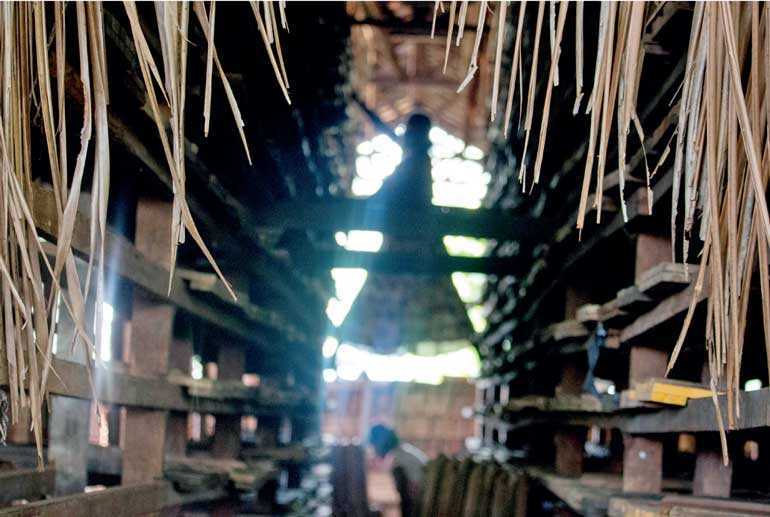 In order to avoid them being burnt and warped in the heat of the sun or suffer damages in the rain, the moulded clay tiles are meticulously stacked on shelves inside sheds which are about 20-30 feet high. These shelves have the capacity to store around 1,000 tiles. Usually, it takes a week or two to dry the tiles before they are sent out to the kiln. Dried clay tiles which are stacked outside the shed will be loaded on the kiln. Burning is done with mahogany and mango wood. The kiln can burn about 12,000 tiles at a time with the consumption of 60 cubic yards of firewood. On the brick flooring, the tiles are packed as closely as they will lie on edge, course upon course. The doorways of the kiln known as ‘kaanu’ are used for loading and unloading the wood. The temperature inside the kiln must be controlled from the exterior in order to get the right texture and colour of the tile. Depending on the nature of the kiln, the heat is kept approximately between 650 and 850°C inside. The burning process takes nearly a week, until they are ready to be unloaded. The doorways are broken down after 24 hours and temperature is allowed to go down so that it will be convenient for unloading. Afterwards, the tiles are sorted according to quality and ready to be sent off to the store. Clay tiles provide a secure shelter for humans against natural elements like the sun, the rain, the wind. They are capable of withstanding weather variations by preserving the complexion for several decades. Heat insulation and thermal comfort are some of the concerns that we look into when we construct a house in a tropical country. This is why Sri Lankans opt for traditional clay tiles for roofing as it adds a touch of warmth to the home, keeping the heritage alive and the living space cosy. Unlike asbestos sheets and G.I. sheets which are known to pose health hazards, clay roofing tiles are environmentally friendly and vapour-permeable, while also adding a captivating appearance to any building or house.